“There is no secret,” insisted Francois Roode, winemaker at Diemersfontein. (pictured). I had managed to trap him at the rear of his cellar with his back to the wall and barrels stacked either side blocking him in, and before he could get past me and back to the vintage he’d have to tell me the secret behind Diemersfontein’s cult ‘coffee and chocolate’ Pinotage. But Francois is quietly confident he has another winner on his hands, and the 2007 vintage will keep the legion of fans for this most distinctive wine very happy. Sue Courtney visited Kerr Farm in Kumeu, New Zealand today, 17 February, just as their Pinotage grapes reached veraison -- and if that is a term new to you, then Sue will explain all if you click here and show Kerr Farm's spiffy new label design for the 2004 Pinotage. Jaison Kerr, who purchased the vineyard in 1989, says "The Pinotage 2004 called "PO4" is so good we designed a new label for it." Meanwhile, I am in South Africa where the early ripening Pinotage is mostly picked and already fermenting, but I was intrigued to read a snippet in an article about picking Shiraz by J P Rossouw, of the release a single vineyard Pinotage from Meerendal. The wine, called 'Heritage Block' Pinotage 2005 comes from a vineyard planted in 1955, thus the vines were 50 years when the grapes were harvested, and they must join Bellevue Estate and De Waal's 'Top of the Hill' vineyard as the oldest in the world. Meerendal has been added to on my list of wineries to visit and I must taste 'Heritage Block'. 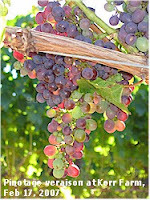 photo of Pinotage Veraison at Kerr Farm was taken by and is (c) Copyright Sue Courtney and is used with her kind permission. 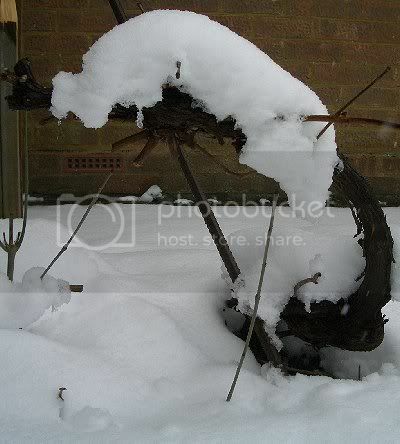 That day is almost upon us, and as I look out at the heavy snowfall covering everything with white and merging into the freezing fog in the near distance so that it seems I am in a white cocoon my thoughts turn to a warming mouthfilling red Pinotage. Wine Diva Caroline Lowings has chosen Spier Discover Pinotage Rose as her Valentines Pick of the Week; she finds it "a delicious profusion of candy, strawberry and lingering berries." The last Pinotage Rose I had was Sperling and Sperling Pinotage Rose, made at Delheim Estate by Canadian winemaker Ann Sperling of Malivoire Wines in Ontario together with Victor Sperling of Delheim. It had a delightful rosy colour, natural Pinotage sweetness makes this dry wine very approachable drunk on its own as an aperitif. It is available in Ontario LCBO stores. but I'm smiling because, if they've cleared the runways of snow, I'll be flying to Cape Town tomorrow, and I have a lunch booking at Delheim Estate for Monday where I might just order a bottle of their Pinotage Rose. Because it is going to be hot there!! I came across these tasting notes for two wines I had with dinner last year. Beautiful deep black/red colour. There's a silky mouthfeel and a delicious rich depth, with plum, cherry, cinnamon and spices. Wonderful complex and rewarding wine. I opened my only bottle of this wine and found it had a dense garnet colour, with a little smokiness on the nose and front palate, but with a core of concentrated dense red fruits - black cherry and mulberry , a there is a little spice and tobacco and some soft drying tannins on the finish. Lovely stuff. 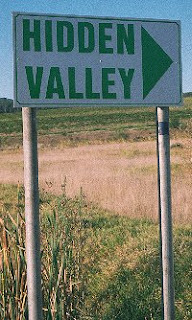 Hidden Valley's vineyards are in Devon Valley, access to which is along a no-through road that terminates at JC le Roux Sparkling Wine Cellars. Along that road is the sign shown here on the left. It always amuses me that there is such a large sign for a hidden valley. But the name comes from the owner of the vineyard and winery owner, Dave Hidden. 2005 Southern Right Pinotage - Little staining of glass, light bodied and a tangy finish. This is an almost delicate wine with purity of fruit, certainly no block buster and seems like Burgundy is the inspiration. 2005 Groot Constantia Pinotage - There's a European feel to this wine, quite restrained with a good balance of red plum fruits and tannins and a very long finish. 2001 Bellevue Estate Pinotage - Black dense cherry and blackberry fruit flavours, tobacco underneath, hint of eucalyptus and with a very long finish. A very enjoyable serious wine made from 58 year old bush vine grown on sandy soil, aged 10 months in 50% new 300l American oak barrels. 13.5% abv. ABSA Pinotage Top 10 winner in 2002. I have heard all sorts of criticism of Pinotage, but I have never before heard it described as 'weedy'. However, Gordon Stimmel writing in the Toronto Daily Star says "And shiraz is becoming a hallmark high-quality red, which will, I hope, replace the still too weedy Pinotage (a crossing of pinot noir and cinsaut grape vines) that has for too long been the dominant signature red grape of South Africa." But he does find one expression of the variety he likes - "Delheim 2006 Pinotage Rosé ($12.95, 87) with its gentle rose petals, lime peel, cranapple and strawberry stylings." Mike Tipping, in The Press (York, England) admits that "South Africa's pinotage grape is not everyone's cup of tea, but I like it. Beyerskloof Pinotage 2005 (Sainsbury's £5.99, 18/20) is astonishingly good for the price. It's spiky stuff, with smoky oak, brambles, chocolate and aniseed." No weediness there, nor in this match for haggis as the anonymous 'Wine Seller' in Scotlands Daily Record reports: "The Bay Pinotage 2003 (South Africa) £5.99 - Coop. This is from Hamilton Russell Estate, one of South Africa's best wineries. It's big with dark, spicy, smoky fruit and sweet oak notes to balance. This needs food and is a perfect match for haggis." 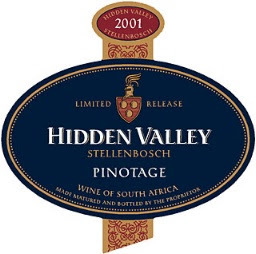 I am off now to open a 2001 Hidden Valley Pinotage. It is one of the Pinotages stocked in the Ontario Monopoly store LCBO where it costs what looks like a very reasonable $22.95 (£9.85) - I recall Hidden Valley costing £16.95 in Sainsbury's several years ago. Not that I have seen it anywhere on the shelves recently. Rarer than hens teeth, more tasted and talked about than drunk, 2007 sees a new vintage of Ashbourne released. The first was the 2001 vintage, now along comes 2004. Have I tasted it? Heck no -- none had arrived in the country in time for their recent UK agents tasting. 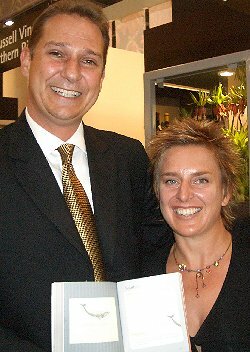 But South African food and wine writer JP Rossouw went to the Hamilton Russell Vineyards launch earlier this month. 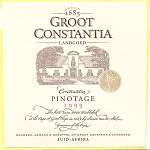 He writes in his blog "The 2004, to my palate, reminds me much more of pinotage, with more primary fruit. I would be surprised if this wine does as good a job of being the “fine wine without an obvious mother” that the 2001 was. Fuller fruit expression with more of pinotage’s ripe winegum notes open into a wine that is again very well-styled and age-worthy, but less mysterious. And perhaps this is a very good thing for the variety." For JP, the 2001 " is a wine that you could secretly show in the company of Bordeaux blends – indeed few pick it as pinotage. This makes it something of a Pyrrhic victory for the variety. At once a wonderful wine and one that does not taste like any other pinotage, it presents little for the pinotage mainstream to cling to and is difficult to harness for the greater marketing of the grape." Which again raises the question, what is Pinotage supposed to taste like? Far too many people first tasted Pinotage as an old fashioned nail-varnish and bitter monstrosity, and that is what they think the variety is. When you can get them to taste a decently made wine they say, well OK, but it doesn't taste like Pinotage. Read the Dallas Post review of Fort Ross Pinotage and ask yourself if you'd guess the wine in question was Pinotage just by reading the review on its own. Why don't California and New Zealand Pinotages suffer from bitterness and nail varnish flavours? Asbourne is a project by Anthony Hamilton Russell who firmly believes in Pinotage and the wine is unusual in that it doesn't name a grape variety. Anthony wants people to judge the wine on its merits. *and frequently Ashbourne is kept under the table and poured only for the great and good. Grayhaven Winery, in Central Virginia, USA, is about to release their first varietal Pinotage, but it hasn’t been easy, as Max Peple-Abrams told me. "Our first Pinotage planting was in 2000," she says. " We lost every single plant - ouch. We scrambled and found another 30 vines and they all survived. We graft our own now and haven't had any problems....save for Japanese beetles and birds and drought and monsoons and all the lovely things mother nature throws our way in the great state of Virginia .... one can certainly understand why Thomas Jefferson didn't quit his day job! We have less than 1/3 acre of Pinotage vines here and have to supplement with Pinotage grapes grown in California. We graft off our existing vines every year to increase our production - it's slow going. To meet the current demand for our Pinotage, we are looking to eventually have about 2000 vines. We thin our crops pretty well so the quality is high but our yield is less than 1/2 of what a large commercial vineyard would get from the same vine count.